The astonishing upward trajectory of Facebook’s stock price — documented in the above chart between June 2012 and May 2014 — was catalyzed in late October, when the company announced that it would be adding app install ads to its mobile news feed. Since that time, Facebook’s mobile ad revenue has grown at an impressive clip – in its most recently quarterly filing, Facebook revealed that revenues from mobile ads grew by 30% from the same period the year before and that those revenues represented nearly 2/3rds (59%) of the company’s total ad revenue. Clearly, mobile ads are a lucrative business. 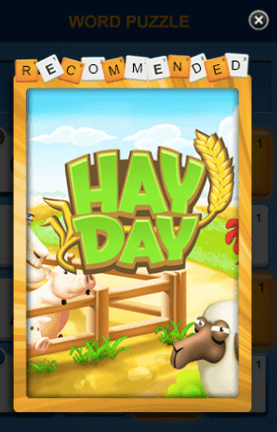 A gold rush has now commenced over mobile app install ads. The largest mobile game developers have a rapacious appetite for ad inventory — King, the developer of Candy Crush Saga, for instance spent nearly $400MM on marketing in 2013 – which shows no signs of abating. The demand for premium mobile ad inventory is far larger than Facebook alone can service, prompting many companies to lay claim to a portion of the vibrant and ever growing market by creating new channels and opportunities for app developer to display ads. App developers are happy to oblige this development. The inexorable climb of marketing prices is often cited as a detriment to the expansion of the mobile app ecosystem, but in actuality, it’s an opportunity: marketing prices are increasing because users are spending ever more money in mobile applications. The developers with the best monetizing apps are thus happy to pay increased prices month-over-month for ad inventory as those prices coincide with the erosion of stigmas around virtual goods and increasing smartphone and mobile wallet penetration in the developing world. Similarly, app developers with poorly-monetizing but popular apps are happy to reap the rewards of climbing display payouts. Four of the latest and most high-profile new channels and ad formats for mobile user acquisition are highlighted below, each described in terms of their pros and cons and potential for delivering user base growth to a mobile app. While this is by no means an exhaustive list, it does showcase the innovation that is being brought to the space in terms of ad formats, targeting, and advertising yield management. 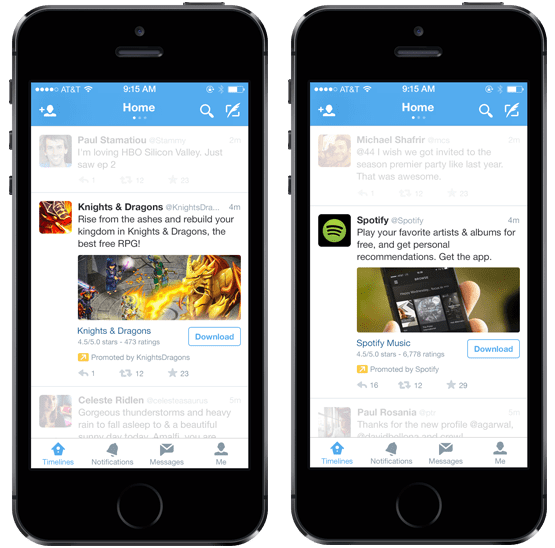 On April 17th, 2014, Twitter announced the launch of its mobile app install product – a card-based advertising unit in the Twitter feed that would resemble the existing Sponsored Tweet unit but link to a mobile app’s store profile. In the announcement, Twitter also revealed that would allow advertisers to manage campaigns across both the Twitter and MoPub (which Twitter acquired in September 2013) platforms from a single interface, ads.twitter.com. Twitter’s card-based mobile app install ad unit is the most similar to Facebook’s, but at 184MM mobile users, Twitter’s mobile reach is significantly lower than Facebook’s 1BN mobile MAUs. The look and feel of Twitter ads won’t be jarring to users, as the card format resembles the existing sponsored tweet format. Targeting specific demographics on Twitter may be difficult, as users don’t supply much information in their profiles and all interest data will need to be semantically harvested from tweet content. Twitter only recently allowed for language-based targeting, which is a fairly fundamental targeting capability for an ad unit. In late April, just around the time of Twitter’s mobile app install ad announcement, Google revealed that it would be expanding its AdWords advertising network to mobile, allowing app developers to advertise their apps next to mobile search results. In addition to the content of a user’s search query, Google will be able to target the ads it displays using the wealth of information it possesses about its (logged in) user base. One novel aspect of Google’s mobile AdWords product is its ability to facilitate deep-linking and re-targeting on the basis of user intent. 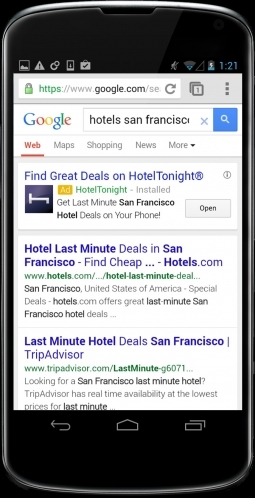 The prototypical use case for the ad format was described by Google in the announcement using the HotelTonight app as an example: if a person searches for “Hotels in San Francisco” on their mobile device, and that person has the HotelTonight app installed, an ad for HotelTonight might appear above the search results which, when clicked, takes the user to a list of hotels in San Francisco within that app. Intent-based searches will likely convert better, both for original downloads and re-targeted downloads. Intent-based search ads will likely not work well for entertainment apps or games. Native app install ads offer a developer the opportunity to integrate ad units seamlessly into the content of their apps – they generally feature only the icon and a brief description of another app and are placed within a template designed by the app developer to not disrupt the user’s experience. Native ads are becoming popular on mobile as click-through rates for traditional mobile app install ad formats – interstitials and banners – decline. Leading the charge with native ads in terms of innovation and novelty is Appsfire, the mobile app discovery platform. To date, Appsfire has developed three native ad products – Sashimi, Ura Maki, and Brichter-San – that app developers can integrate into their apps at practical waypoints to avoid content disruption. Sashimi for instance allows apps that feature content feeds to insert mobile app install ad units into their native content stream while maintaining a consistent aesthetic. Other ad networks have begun to offer native ad units, too, such as InMobi, with its “native interstitial” ad unit – a smaller-than-normal interstitial ad with a customizable border – and its “native content” ad unit. Native mobile ads offer developers complete control over the aesthetic consistency of their apps. Very little control over the design of native mobile ads is given to advertisers, which may impede optimization. One nascent area of progress in mobile advertising is contextual awareness and recognition – matching ad inventory to the content it is displayed next to or to the actions of the end user to better pair ad units with intent. 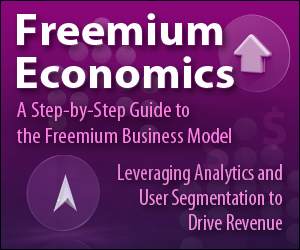 Ad units are generally only optimized for the “sites” (specific mobile applications) they best convert in, but readying these models can take days (meaning a campaign underperforms until sufficient data has been collected) and the process doesn’t benefit from past campaigns not involving both that that ad unit and that destination site. Contextual mobile ads aim to glean lessons from context – user actions, search terms, semantic sentiment, etc. — to be applied to the ad serving process, avoiding the specificity of site-to-ad-unit optimization and delivering relevant ads with the benefit of prior models. One of the most exciting companies in this space is Xyo, which recently launched its contextual ads product and inked a distribution deal with Deutsche Telekom to power the German telecommunication company’s Top Apps recommendation service. In an app search context, Xyo parses intent from user-provided keywords and the apps already installed on their phone to supply relevant results. In a search setting, contextual mobile ads are not likely to be seen as intrusive by users. Ads for very specific or niche applications may not be able to achieve substantial placement rates in a contextual setting.